Barcelona have been drawn against Pep Guardiola’s Bayern Munich in the Champions League semi-finals. The other last-four tie sees Juventus – in their first semi-final since 2003 – face Carlo Ancelotti’s Real Madrid, the defending champions. The first legs will be played on 5 and 6 May, with the return matches a week later. In the Europa League, holders Sevilla face Fiorentina, while Rafael Benitez’s Napoli are up against Ukraine’s Dnipro. Bayern boss Guardiola won 14 trophies as a manager – including the Champions League in 2009 and 2011 – during four years at Barcelona. He has reached the Champions League semi-finals in each of his six seasons as a manager, four with Barca and now two with Bayern. The Catalan said: “Everyone understands how special this game is for me, for [midfielder] Thiago and my staff. “Barcelona was our life. Barcelona is my home. Real Madrid’s Javier Hernandez scored an 88th-minute winner to settle a tense Champions League quarter-final against neighbours Atletico in the Bernabeu. The visitors frustrated Real for the majority of the match, but the game opened up when Atletico’s Arda Turan was sent off in the 75th minute. With the game heading for extra-time after the first leg ended 0-0, Cristiano Ronaldo drove forward and squared for Hernandez to slot home. Real will join fellow La Liga heavyweights Barcelona, plus Germany’s Bayern Munich and Serie A side Juventus, in the final four yet none are likely to provide a sterner test of their attacking mettle than their cross-city rivals. Atletico were well-drilled and extremely difficult to break down, but the tie turned in Real’s favour when Turan was sent off for a second bookable offence – the Turkish midfielder fouling Sergio Ramos. Turan had been assigned to man-mark Ronaldo and he did the job to perfection during the time he was on the pitch. With Real shorn of two of their attacking stars – Gareth Bale and Karim Benzema – through injury, they often looked short on ideas up front with Ronaldo struggling to escape Turan’s attentions. Treble-chasing Juventus reached a first Champions League semi-final since 2003 as they defended solidly to earn a second-leg goalless draw in Monaco. The runaway Serie A leaders, who are also in the Italian Cup final against Lazio, led 1-0 after the first leg through Arturo Vidal’s penalty. The hosts dominated possession for the majority but rarely tested Juve goalkeeper Gianluigi Buffon. Home substitute Dimitar Berbatov did have a shot smothered after the break. The Old Lady have become the first Italian side to reach the semi-final since Inter Milan won the competition back in 2010. Bayern Munich made light work of a 3-1 first-leg deficit as they battered Porto 6-1 to sail into the last four of the Champions League with a 7-4 margin on aggregate. It was supposed to be a night that would test Bayern boss Pep Guardiola’s mettle after last week’s disappointing defeat in Portugal, but his charges made a mockery of such predictions with five goals in 26 minutes in the first half. Thiago Alcantara, Jerome Boateng, Robert Lewandowski (two) and Thomas Muller caused the damage as they mercilessly tore their Primeira Division opponents apart with scintillating passing, breathtaking movement and ruthless finishing. Porto went into this clash unbeaten in the competition so far and they were given a brief glimmer of hope when Jackson Martinez headed in, but their evening got worse still when Ivan Marcano was sent off late on and Xabi Alonso fired in the resulting free-kick. The reigning Bundesliga champions, who were even missing key players such as injured duo Arjen Robben and Franck Ribery, now march on to their fourth consecutive Champions League semi-final after a fantastic night. It was clear that Julen Lopetegui, who was a former team-mate of opposite number Guardiola at Barcelona in the 1990s, was happy for his Porto side to sit deep and try to protect their first-leg lead from the off. But chinks appeared in Porto’s gameplan as early as the 10th minute when Lewandowski hit a post – and half an hour later they found themselves 5-0 down on the night. Thiago, who scored Bayern’s consolation at the Estadio do Dragao last week, kicked off the rout by nipping in front of his marker at the near post to nod home from Juan Bernat’s superb cross after 14 minutes. Amid the hostile environment of a raucous Allianz Arena Porto began to fall apart and Bayern levelled the contest on aggregate in the 22nd minute, with Boateng heading in his first goal of the season after Holger Badstuber nodded Thiago’s corner back across goal. The Germany international’s effort had just enough pace to creep past Fabiano, but questions will have to be asked about the Porto keeper after he seemed slow to react. The visitors could have no complaints about Bayern’s truly exquisite third, which completed a three-goal 13-minute salvo to totally turn the tie around. First, Philipp Lahm showed his class with an inch-perfect cross on the volley, before Muller unselfishly flicked the ball onto Lewandowski’s head and the Polish striker made no mistake from close range. Muller twisted the knife with a somewhat fortuitous, somewhat hilarious, fourth as his low shot from distance was deflected off Bruno Martins Indi and totally caught poor Fabiano off-guard as the ball trickled through his legs when he tried in vain to clear on the floor. With Porto shell shocked, Lewandowski was hardly feeling charitable as he picked up the ball from Muller around the penalty spot and showed ice-cool composure to work an opening before firing it low past Fabiano with deadly accuracy. Understandably the pace relented from the hosts after the interval, but they were still in complete control of proceedings before Martinez gave the visitors a glimmer of hope. The striker, who has been linked with a summer move to the Premier League, caught Bayern’s under-worked backline out to head in Hector Herrera’s cross in the 73rd minute, even though replays showed he was clearly offside. With that goal reducing the aggregate deficit to back to 6-4, Martinez went close with a shot from distance that had Manuel Neuer flustered before it went wide, but that was as close as Porto got to creating a tense finale. Things got even worse for them when Marcano picked up a second yellow card for a wild lunge on Thiago with five minutes left and Alonso fired in the free-kick with aplomb to complete the scoring. Barcelona reached the Champions League semifinals for the seventh time in eight years after comfortably brushing aside the challenge of Paris Saint-Germain. Barca did most of the damage in the first leg with a 3-1 win in Paris and they finished the job off with relative ease at the Camp Nou, with two first-half Neymar goals earning a 2-0 win. Luis Enrique’s in-form side will now go into Friday’s mouthwatering draw for the last four along with Bayern Munich, with one of last season’s two finalists — Atletico and Real Madrid — joining them, as well as either Juventus or Monaco. The 5-1 aggregate victory also keeps Barca firmly on course for the Treble, having already reached the final of the Copa del Rey and boasting a two-point lead in La Liga with six games to go. Neymar broke the deadlock in the first leg and it was the Brazilian who got things up and running on Tuesday as well, although it was some Andres Iniesta magic that made it happen. Iniesta, wearing the captain’s armband, missed the weekend win over Valencia through injury but showed no sign of any ill-effects as he brilliantly beat three players as he charged through the PSG midfield before threading a perfect pass into Neymar’s path. 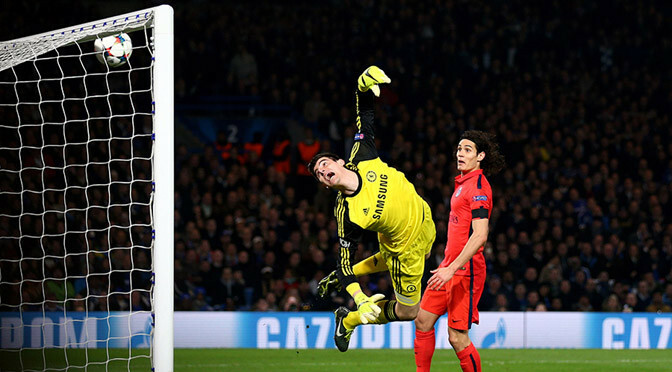 The Brazilian did the rest, rounding Salvatore Sirigu and slotting into an empty net. Dani Alves tested Sirigu with a long-range piledriver that the PSG keeper did well to parry, but he was beaten for a second time in the 33rd minute as Barca further strengthened their grip on proceedings. Alves teased former Barca team-mate Maxwell on the right before floating in a left-footed cross that Neymar, having ghosted in behind David Luiz, easily headed past Sirigu. The tie was as good as over, although PSG continued to battle and another of their ex-Barca contingent Zlatan Ibrahimovic — who had an effort correctly ruled out for offside in between Neymar’s strikes — almost brought them a goal midway through the second half. The Sweden international, who missed the first leg due to suspension, ignored the run of an unmarked team-mate to try his luck from 25 yards out and his well-struck effort drew an awkward save out of Marc-Andre ter Stegen. Edinson Cavani and Blaise Matuidi then tried to scramble the ball home with 10 minutes left as the French champions continued to probe, albeit against a Barca side that already knew the job was done. Substitutes Lucas Moura and Ezequiel Lavezzi both also spurned openings to get on the scoresheet for Laurent Blanc’s men before Lionel Messi fired a shot just wide at the death for Barca, who have now won 23 of their 26 competitive games in 2015. Juventus will take a narrow lead to Monaco for their Champions League last-eight second leg after Arturo Vidal’s penalty split the sides in Turin. Yannick Ferreira-Carrasco wasted a clear opening for the visitors before Carlos Tevez fluffed a volley for Juve. Vidal, who had blazed over just before the break, then blasted home an emphatic penalty following Ricardo Carvalho’s trip on Alvaro Morata. Dimitar Berbatov headed just over but Monaco were mostly kept at bay. Leonardo Jardim, the Principality side’s manager, claimed that the result was a “big injustice” with the decisive spot-kick “inexistent”. Repeated viewings suggested Carvalho tripped Morata fractionally outside the penalty area, but it would be hard to blame referee Pavel Kralovec on such a marginal call. Juventus might also have argued that as the last defender, Carvalho was fortunate to see only yellow for the foul. Monaco had enough chances to return home level, regardless of the official’s decision. Gareth Bale missed a glorious chance as Atletico Madrid held rivals Real Madrid to a goalless draw in the Champions League quarter-final first leg. Wales forward Bale was through on goal in the third minute, but was thwarted by Jan Oblak, who was impressive for the home side throughout. The goalkeeper also made a crucial save from James Rodriguez, as Mario Suarez missed a late chance for Atletico. The sides meet again in the second leg at the Bernabeu on 22 April. Real are aiming to become the first team to win back-to-back European Cups since AC Milan in 1989 and 1990, having defeated Atletico in last season’s final. Carlo Ancelotti’s men have now not beaten their opponents in seven meetings since claiming La Decima – their 10th European Cup – which includes a 4-0 La Liga thumping in February. Lionel Messi and Barcelona turned on the style to dump Manchester City and their inspired goalkeeper Joe Hart out of the Champions League. It was thanks to Hart’s heroics that Barcelona could manage only a 1-0 win at the Nou Camp. Ivan Rakitic scored the only goal of another one-sided encounter between the two sides, completing a 3-1 aggregate win to secure the Catalan giants’ place in the quarterfinals. City did show some spirit in the second half, and could have pulled one back when Sergio Aguero had a penalty saved by Marc-Andre ter Stegen — but in truth the scoreline flattered them. Barcelona were in a different league to the English champions, and Messi was simply outstanding. One of the enduring images from the game will be his first-half nutmeg on James Milner, who was bamboozled and left on the turf by the Argentinian’s brilliance. It said much for City’s night that their man of the match was comfortably Hart, who made a strong of brilliant saves in the second half to limit the damage. The loss will leave City manager Manuel Pellegrini fighting for his future, but most coaches would have struggled against Barcelona in this mood. City’s defeat meant the end of English involvement in the Champions League, after Arsenal and Chelsea’s defeats at this stage and Liverpool’s elimination in the group round. Pellegrini changed tactics, deploying Aguero as a lone striker, but it was to little avail. After being well beaten in the first leg, it always seemed likely City would follow their Premier League rivals out of the competition. And so it proved as Barcelona set about them from the outset, looking in ominous form as Dani Alves forced a Vincent Kompany error and Neymar rolled a shot against the inside of a post. Barcelona were relentless, with Messi at his ingenious best, continually wrong-footing City with masterful control and movement. Messi combined brilliantly with Andres Iniesta in the box, but Hart came to the visitors’ rescue with a low save from the Argentinian. City could not keep pace with the Spanish league leaders and four of their players — Fernandinho, Aleksandar Kolarov, David Silva and Samir Nasri — were booked inside the first 36 minutes. Nasri was lucky not to see red for hacking at the ankles of Neymar. But by then City were already a goal down after Messi picked out Rakitic in space in the box with a brilliant cross. Rakitic controlled superbly on his chest and reacted quickly to lob the advancing Hart. City’s torture continued as Messi, who had earlier been crudely hacked down on the touchline by Kolarov, reacted with great dexterity as Milner attempted to close him down out wide. Messi simply flicked the ball back inside, nutmegging the England international and dumping him on the turf. Former Barcelona manager Pep Guardiola, watching in the stands, put his head in his hands in disbelief. Barcelona almost had a second goal before the break as Luis Suarez, scorer of two in the first leg, broke clear and beat the advancing Hart only for his shot to bounce off the far post. The one-way traffic continued as Hart saved from Iniesta, Rakitic and Jordi Alba in the opening minutes of the second half. Pellegrini attempted to change his side’s shape, with Jesus Navas having replaced the ineffective Nasri at the interval. He pushed Toure forward, but Barcelona were not greatly troubled despite an increase in City possession. One good opportunity did open up when Navas got to the byline, but there was no-one on hand to turn in his cross. Barcelona had the menace to be able to kill the game at any moment, and Suarez lashed a shot into the side netting before Messi skipped past a challenge on a lightning counter-attack but was forced wide. Alba thought he had scored a second when he snapped up a rebound after Hart blocked a Neymar shot, but offside was given. Hart denied Neymar again on the hour and City were given a potential lifeline moments later as they broke up to the other end and Aguero fell as Gerard Pique challenged. A penalty was awarded, but Aguero could not take advantage as Ter Stegen saved to his right. It was not going to be City’s night, but Hart could still hold his head high, saving again from Suarez before the former Liverpool star hit the bar. Hart saved brilliantly again from Messi in the last minute and Neymar was also frustrated by him in injury time. Arsenal won 2-0 in Monaco in the second leg of their Champions League last-16 clash but couldn’t recover from defeat at the Emirates three weeks ago, going out on away goals after drawing 3-3 on aggregate. Olivier Giroud put the Gunners in front in the 36th minute but they struggled to create clear-cut openings before Aaron Ramsey doubled their advantage 11 minutes from time. Arsene Wenger’s side piled on the pressure as the clock ticked down but couldn’t force a third goal which would have taken them through against the odds. After a slow start, Giroud headed a half-chance wide after 13 minutes. Arsenal were lacking a spark as Monaco, who had not conceded a single goal in their three home Champions League group stage games earlier this season, happily took the tempo out of the match. Giroud, who had missed several chances in the first leg, grabbed a lifeline for the visitors with a well-taken finish nine minutes before half-time. Monaco continued to ride their luck as Arsenal pressed, with Mesut Ozil’s free-kick tipped over at the start of the second half. The game then opened up as Arsenal committed men forwards, and finally reduced the arrears further through substitute Ramsey after 79 minutes. There was, though, to be no miracle of Monte Carlo as Monaco goalkeeper Danijel Subasic denied a late header from Sanchez to end Arsenal’s European dreams at the last-16 stage once again — and leave Arsene Wenger’s men counting the cost of conceding a stoppage-time third goal at the Emirates Stadium. England forward Danny Welbeck started in support of Sanchez and main striker Giroud, with Theo Walcott again on the bench as manager Wenger named an attacking side on his return to the club he led to the French league championship in 1988. Despite Arsenal’s positive intentions, they remained vulnerable on the counter-attack, with Joao Moutinho curling an early 20-yard effort over following a quick break by the home side. Officially only around 1,500 Arsenal fans had made the journey to the French Riviera, but given tickets were put on general sale, there were more than double that around the Stade Louis II. Arsenal, though, struggled to find any sort of early flow as Monaco slowed the tempo, which suited the game of veteran former Tottenham and Manchester United striker Dimitar Berbatov. As the quarter-hour mark approached, Arsenal full-back Hector Bellerin got away down the right and whipped the ball into the six-yard box, from which Giroud glanced just wide. Arsenal centre-half Laurent Koscielny cannoned the ball up against the crossbar from close range after a deep free-kick into the Monaco penalty area, but the offside flag was raised. Arsenal continued to look for an opening, but were frustrated by some solid defending from the hosts as the game. The breakthrough finally came after 36 minutes. After left-back Nacho Monreal had done well to keep the ball in on the far side, Danny Welbeck darted into the penalty area. The loose ball fell for Giroud, and his shot was saved but cannoned up against his face, with the French striker alert to sweep in the rebound. Arsenal almost grabbed a quickfire second when Welbeck’s fierce, low shot hit Aymen Abdennour on the inside of his leg as the defender was sprawled on the ground. Sanchez was shown a yellow card by Norwegian referee Svein Oddvar Moen for tumbling in the penalty area as Nabil Dirar touched him on the back. In first-half stoppage-time, Welbeck’s low cross from the right flicked up off Giroud’s knee and into the grateful arms of goalkeeper Subasic. The Croatian was in the right place again at the start of the second half to acrobatically tip over a curling 20-yard free-kick from Ozil. Although Monaco did not need to score, they still carried a threat on the counter as Arsenal pressed a high line. Wenger made a positive change after 63 minutes as Ramsey replaced holding midfielder Francis Coquelin. Ozil flashed a low drive wide as Arsenal again created a good opening which lacked a telling finish. With 20 minutes left and two goals still needed, Welbeck was replaced by Walcott. Arsenal’s pressure finally told when Ramsey made it 2-0 with 11 minutes left. Monreal darted into the left side of the Monaco penalty area, before cutting the ball back to Walcott, whose low shot came back off the base of the post. Layvin Kurzawa should have cleared but stabbed the ball to Ramsey, who cracked it into the bottom left corner to set up a grandstand finale. Subasic clawed Sanchez’s close-range header off the line, but despite pouring forward during five minutes of stoppage-time, Arsenal were again left to reflect on what might have been. The Monaco bench celebrated wildly as the principality club reached a first Champions League quarter-final since 2003-04. Chelsea crashed out of the Champions League on a stormy night at Stamford Bridge as Paris St-Germain reached the last eight on away goals after extra time. PSG came from behind twice to take revenge for last season’s quarter-final exit at the hands of Chelsea – showing great character to play for the last hour of normal time and the added 30 minutes without talisman Zlatan Ibrahimovic after he had been sent off for a foul on Oscar. In an ugly eyesore of a match punctuated by fouls and contentious incidents, Gary Cahill’s late goal looked to be sending Chelsea through until their former defender David Luiz thumped home a header to send this last-16 tie into extra time. Once more Chelsea went ahead through Eden Hazard’s penalty following Thiago Silva’s handball but PSG’s Brazilian defender made amends perfectly with another superb header six minutes from time to give coach Laurent Blanc’s side the progression they deserved. While PSG complained about Ibrahimovic’s red card – and the reaction that saw nine Chelsea players crowd referee Bjorn Kuipers – Chelsea suffered injustices of their own as Diego Costa was denied a clear first-half penalty when he was fouled by Edinson Cavani. As a series of running battles broke out, Costa was fortunate to stay on for a shove on Marquinhos, having been booked earlier for a wild lunge on Silva – the game degenerating into a niggly, fractious affair. For Chelsea coach Jose Mourinho, who sets such store by the Champions League having won it with Porto and Inter Milan, this will be a devastating blow but he can hardly make a case that his side were unlucky after such a flat performance, even with a numerical advantage. 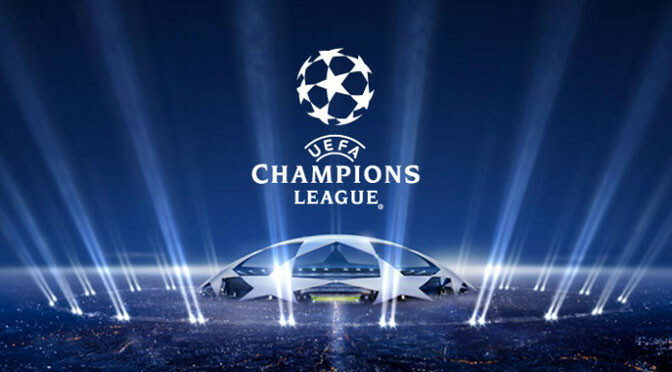 And now the Premier League, so often boasting its status as the greatest in the world, faces the prospect of a Champions League wipeout at the last-16 stage with both Manchester City and Arsenal also fighting against the odds after home defeats by Barcelona and Monaco. Ibrahimovic had been on the periphery of a game that had plenty of slick passing without cutting edge – but he was the central figure as he received his red card after 31 minutes. The giant Swede arrived late in a 50-50 challenge with Oscar, leaving the Brazilian writhing on the ground in agony. Referee Kuipers produced the red card while surrounded by almost the entire Chelsea team, excluding the stricken Oscar and keeper Thibaut Courtois, who had arrived at the scene en masse. If PSG were harbouring a sense of injustice, they were fortunate to escape twice in quick succession, first when Luiz appeared to catch Costa with an elbow off the ball and then when the striker was clearly tripped by Cavani in the area, only for penalty appeals to be ignored. Cavani now carried the responsibility for getting the goal PSG required but he was guilty of a dreadful miss as the hour approached, doing everything right to round Courtois only to strike the near post from an angle with the empty goal beckoning. It could have proved an expensive miss and PSG’s frustration only increased when they were convinced Costa should have received a similar sanction to Ibrahimovic when he flattened Silva and was fortunate to receive just a yellow card. Their misery seemed complete when Cahill put Chelsea ahead nine minutes from the end of normal time with a goal that mirrored the game. It was a scrappy affair as PSG failed to clear a corner after keeper Salvatore Sirigu saved from Ramires, and Costa’s sliced attempt on goal fell kindly for Cahill to lash home. Chelsea’s fans thought this would be enough but reckoned without the spirit of PSG and they took this frenetic tie into extra time as Luiz beat Branislav Ivanovic to a corner to send a thumping header high past Courtois. PSG’s good work looked to have been undone by that handball by Silva as he contested an aerial challenge with Chelsea substitute Kurt Zouma, resulting in a penalty that was calmly converted by Hazard. Silva was the man who made amends with a towering header from a corner seconds after he had been denied by a magnificent Courtois stop from a similar effort. Chelsea wilted visibly and PSG, who are second in Ligue 1, saw out the game without further alarm to spark wild scenes of celebration among their thousands of supporters inside Stamford Bridge.